Dr. Neil J. Zemmel of Richmond Aesthetic Surgery performs breast augmentation surgery for women with varying needs and goals. 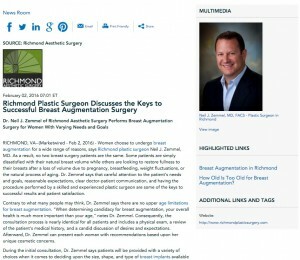 Richmond, VA — Women choose to undergo breast augmentation for a wide range of reasons, says Richmond plastic surgeon Neil J. Zemmel, MD. As a result, no two breast surgery patients are the same. Some patients are simply dissatisfied with their natural breast volume while others are looking to restore fullness to their breasts after a loss of volume due to pregnancy, breastfeeding, weight fluctuations, or the natural process of aging. Dr. Zemmel says that careful attention to the patient’s needs and goals, reasonable expectations, clear doctor-patient communication, and having the procedure performed by a skilled and experienced plastic surgeon are some of the keys to successful results and patient satisfaction. Contrary to what many people may think, Dr. Zemmel says there are no upper age limitations for breast augmentation. “When determining candidacy for breast augmentation, your overall health is much more important than your age,” notes Dr. Zemmel. Consequently, the consultation process is nearly identical for all patients and includes a physical exam, a review of the patient’s medical history, and a candid discussion of desires and expectations. Afterward, Dr. Zemmel can present each woman with recommendations based upon her unique cosmetic concerns. During the initial consultation, Dr. Zemmel says patients will be provided with a variety of choices when it comes to deciding upon the size, shape, and type of breast implants available to them. Dr. Zemmel notes that individuals can try on various implants to see the differences, and even view the potential results of the procedure utilizing state-of-the-art VECTRA® 3-D Imaging. There are silicone and saline varieties; smooth implants and round implants; high-profile and moderate-profile options. Dr. Zemmel says that the best option for a woman’s unique needs ultimately depends not only on how much larger she wants her breasts to appear, but also how the results will enhance breast shape and overall body proportions. He says the best results are typically those that meet the patient’s goals while looking as natural as possible. Dr. Zemmel explains that he custom-tailors each breast augmentation procedure so that the results can truly meet the needs and goals of the individual patient. In order to increase the chances that patients achieve successful results, Dr. Zemmel says, women should be sure to consult with a board-certified plastic surgeon who is experienced with breast surgery procedures and who addresses all of their questions and concerns. He notes that individuals thinking about having this procedure should also view breast augmentation before-and-after photos featuring patients treated by the plastic surgeon they are considering. Dr. Zemmel says patients who thoroughly discuss their expectations and have a comprehensive understanding of how each option can meet their needs are often happiest with their results. Dr. Neil J. Zemmel is a board-certified plastic surgeon and the head of Richmond Aesthetic Surgery. He is a Fellow of the American College of Surgeons and a member of the American Society for Aesthetic Plastic Surgery, the American Society of Plastic Surgeons, and other organizations. Dr. Zemmel offers a full range of plastic and reconstructive surgery procedures for the breasts, body, and face. The practice also offers a number of advanced non-surgical cosmetic enhancement procedures to renew the health and appearance of the skin. Dr. Zemmel is available for interview upon request. For more information about Richmond Aesthetic Surgery, visit richmondplasticsurgery.com, vabreastsurgery.com, and plus.google.com/109479035144616950506/about.